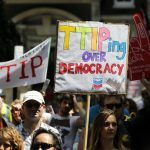 This Saturday (22nd August 2015), across Europe, thousands of people will be taking to their local streets to raise awareness of the Transatlantic Trade and Investment Partnership (TTIP). To find your nearest event and to get involved, please visit the 38 Degrees Organising Hub. To learn a bit more about TTIP, please read on (or download the original PDF document). So what is this TTIP thing anyway? TTIP stands for the Transatlantic Trade and Investment Partnership, a proposed free trade agreement between the USA and the EU. How much do we know about this? Negotiations are being held in secret but there have been several major leaks of draft provisions. (They have been greeted with outrage from unions and civil rights organisations.) And after considerable public pressure, the EU released very limited parts of the draft text. It’s only a major international treaty affecting the lives of over 800 million people, so it’s not like we need to know about it or anything. What does free trade mean? The agreement aim to remove regulations that are obstacles to US companies doing business in Europe and vice versa. It also aims to open up markets like health, education and other public services to those companies. What exactly is “Regulatory Convergence”? A whole range of pesticides are banned in the EU but not in the US. Growth hormones in beef, which have been linked to cancer, are legal in the US but not the EU. 1,200 potentially harmful substances are banned in cosmetics in the EU. Only 12 of them are banned in the US. But won’t it be good for jobs? Some bloke in the papers said it’d be good for jobs. Maybe it will, but probably not in Europe. European wages and conditions are generally higher than in the USA. NAFTA – a treaty like TTIP that involves the USA, Mexico and Canada – cost the USA a million job. Transnationals will always go where the labour is cheapest, and labour costs are generally cheaper in the US. The EU has already warned member states to expect higher unemployment after TTIP. And is all of the above why TTIP is so horrible? Oh goodness me, no! The really horrible part is something called the ‘Investor-State Dispute Settlement.‘ This establishes a secret court that lets a company sue a government if it does something that harms the company’s profits. The Australian government introduced plain packaging for cigarettes to discourage young people from taking up smoking. It worked. They’re being sued for billions by the tobacco giant Philip Morris – because this law damages their profits. The Japanese government decided to phase out nuclear power after the Fukushima disaster and contaminated the area for miles around. They’re being sued for billions by a Swedish energy company. Interesting fact: There is no mechanism for a government to sue a transnational corporation for harming the public interest though. What kind of thing does the UK government do that would harm a corporation’s profits? Just for example, there’s the National Health Service. The mere fact of its existence – treating the sick for free – deprives corporations of the opportunity to charge for those services, either by bidding for government contracts or charging the public outright. If the government wants to avoid being sued, it’ll have to avoid doing anything that might stop transnational corporations making more money. Right now politicians and officials think they’re safe to keep negotiating this deal, because the public doesn’t know about it, and isn’t talking about it. But if we can show that millions of people across Europe don’t want TTIP to happen, they’ll know we’re watching them. Can you urge your family/friends/acquaintances/people you’ve never even met before to sign the huge EU-wide petition to stop TTIP. To find your nearest event and to get involved – Saturday, 22nd August 2015 – please visit the 38 Degrees Organising Hub. ← EPA Action. What You Can Do NOW.